I was thinking the other day. If I could only have one cat, which one would it be? And I discovered there's no way I could choose. So I'm glad I don't have to. They each have their favorite spot on the bed. And when I'm in it they're cuddled up against my legs or on the pillow next to my head, or around my neck. The other day I took a nap on the sofa, wonderful thing, a nap. I didn't need a blanket because all three cats curled up on top of me. Anyone recall what their names are and which one is which? Aww, they look so cute and comfy. Gin Gin is the calico, Woofy is the gray one, and Jezebel is the black one. We have a gray tabby named Bailey, and calico named Booboo. Cats are so funny with there sleeping. Debbie...I knew this one too because I happened to have saved a posted picture:) No way I would choose either. P.S. 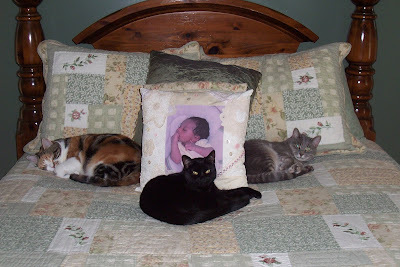 I have a similar pillow like yours that my sister gave me years ago with my pet yorkie's photo on it. It's been YEARS ago and I still have it. I love cats, I just wish I could have one where I live. Good job Dena and Nancy, you remembered which one was which and their names! I'm impressed. Hey Nancy, are you talking about the pillow with Alivia's picture on it? Linda, why can't you have a cat? I think it's a good idea for there to be rules about animals but not letting someone have one is a crime. They bring so much to us. Those are three beautiful cats. Who could chose between Woofy, Jezebel and Gin Gin. Cats are such lovable creatures and lots of company. Nancy I know how you feel. My first lap dog, Sissy, will forever be in my heart. She was about ten and had battled a heart condition for a long time before I had to make the decision to put her down. Broke my heart but I knew she was suffering. Sissy was a toy poodle. Thank you Gladys:) They're also amusing and entertaining.